Have you seen the cascading cards? I love this kind of wow cards. I also like that after it's opened it makes a display but still flattens for mailing. Started with some patterned paper and followed the directions for the card. There are many people who have done videos and written directions. I found it to be a simple card to put together. 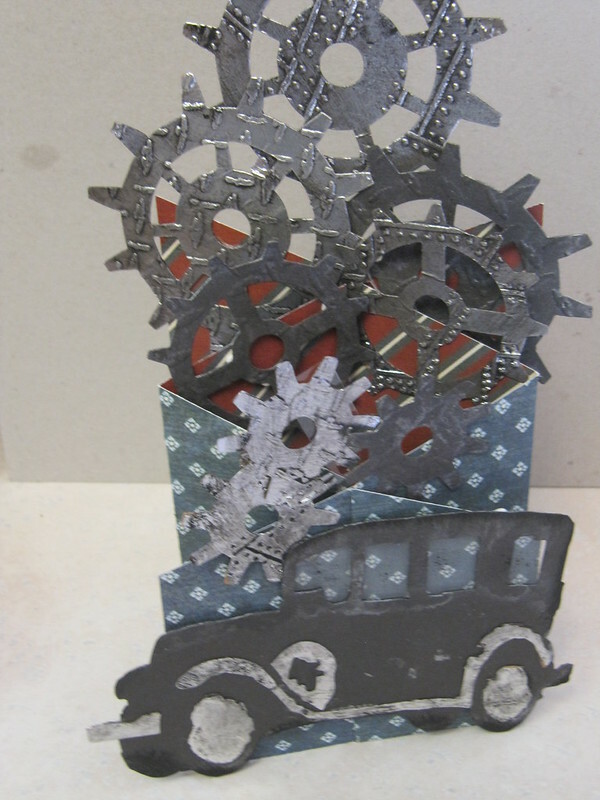 After my card was together I inked and put together the Jalopy, cut the gears from tinfoil covered card stock, embossed and used black paint to distress the. Finally I layered it all up and was finished. I have seen several cards lately that use the clear acetate with a popup to create the illusion of elements floating. I love how this works with the accordion frame die. The technique is very simple. I cut the die out of acetate 3 times and then patterned paper 6 times. I removed the center portion of the patterned pieces and adhered them to the clear pieces. I connected the frames to make the accordion. To finish I adhered butterflies, flourishes, and flowers throughout the card. I was able to match up things so the adhesive didn't show but glossy accents is a good option too. I am on a roll with the thank yous. I have been pulling out some oldie but goodies to make these. Today I have two to share. I remember a time when I used the canvas background stamp on every card I made. I dusted it off today to create a background with it. I have to say my ink techniques have improved a lot since I first used this stamp. I finished my flower by stickling the centers. For this card I started with my sentiment and boxed it in and then masked it while I stamped the flowers. I used another favorite of mine, colored pencils, to color the flowers. I finished again with stickles. Do you have as many buttons as I do? I seem to be obsessed with collecting them but not with using them. I wanted to put a few to good use so I pulled out my Everyday Button Bits set. I love how buttons come in so many sizes and shapes. I was able to fill in all these flower stems. A simple thank you at the bottom finishes it off. Next up are sweet cherries. More flowers with clouds and I tried a boxed in sentiment but clearly I need to work a little on that. Finally I used the cute little bicycle. I like to use this frame on my cards. It allows me to use a smaller stamp on a large card but still have a clean and simple look. Other: Buttons, button twine, fine line pen.